0.71 ct Chrome Tourmaline. A deep forest green, oval cut, loose gemstone. A genuine "Chrome" Tourmaline that has been tested for Chromium using a Chelsea filter. 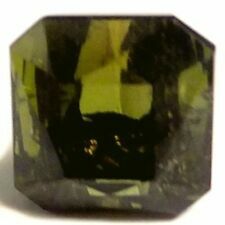 Unlike ordinary green Tourmaline, Chrome Tourmaline glows a distinct orange, through the filter, showing the Cr content. The reason these gems are more sought after than their regular counterparts is the depth of colour they possess. The proportions are good for a machine cut and the color is on the strong side of green. Definitely not a "washed out" gem. All my gems come with a small gift. It is just a little fun to go with your purchase. To make it interesting for those who want the challenge of identifying the gem themselves, the gem id is in a closed slip..
You get one clear top gem box with 5cts. Multi colour Genuine untreated sparkling Mozambique Tourmaline. Size: 2mm and 2.5mm excellent round cut see photo's odd one may have fault?. approx quantity 115 gems. A beautifully coloured stone: the green hue is well saturated without going so far that the gem becomes dark like a lot of Tourmalines. 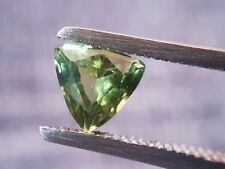 The cut is very good and further brings out the brightness of the gem. Tourmaline this bright is highly sought after and somewhat uncommon to find. All my gems come with a small gift. It is just a little fun to go with your purchase. To make it interesting for those who want the challenge of identifying the gem themselves, the gem id is in a closed slip..
Natural Mozambique Paraiba Tourmaline. Gem: Paraiba Tourmaline. Shape: Trillion. Location mined: Mozambique. colour: Green. Refractive Index tested confirm authenticity. Natural earth mined Pink Tourmaline. From Tanzania. 1.21ct Rubellite Tourmaline. A cushion oval cut, purplish red, loose gemstone. 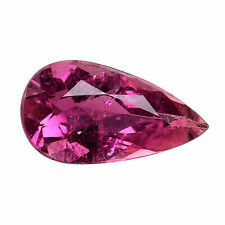 Rubellite Tourmaline is arguably one of the most sought after colors for this multi-colored variety. To qualify for the name, a gemstone needs to not only be a purplish red in color, it also needs that color to be truly vivid. Luckily this particular gem has "vivid written all over it"! It is a stunning purplish red and very bright. It has inclusions, what Rubellite doesn't, but they are quite hard to see without magnification. 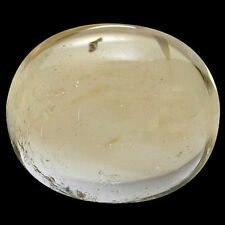 The gem is nice and transparent and has a slightly squared off oval cut. All my gems come with a small gift. It is just a little fun to go with your purchase. To make it interesting for those who want the challenge of identifying the gem themselves, the gem id is in a closed slip.. Product Specifics: on sale is unusual fusion tourmaline loose gemtones ready to be mounted. shape is oval cabochon cut. item is fusion pressured. total Weight of this stone is 5.5 carat. Natural Cut Gems. Natural earth mined Paraiba Tourmaline. Trillion cut Paraiba - YouTube. Shape: Trillion. From: Mozambique. RARE NATURAL NEON BLUE-GREEN PARAIBA TOURMALINE OVAL CUT GEMSTONE . This gemstone is both the most precious and valuable in the world. Make Supersized Seem Small. A beautiful stone. Cut: good. 0.53ct Chrome Tourmaline pear. A very well saturated vivid forest green. A genuine "Chrome" Tourmaline that has been tested for Chromium using a Chelsea filter. Unlike ordinary green Tourmaline, Chrome Tourmaline glows a distinct orange, through the filter, showing the Cr content. The reason these gems are more sought after than their regular counterparts is the depth of colour they possess. The proportions are very close to calibrated making finding a setting for this gem nice and easy, with lots of choices. This is definitely not a "washed out" gem. The colour is very strong and vibrant. All my gems come with a small gift. It is just a little fun to go with your purchase. To make it interesting for those who want the challenge of identifying the gem themselves, the gem id is in a closed slip..
Natural huge bi-color Tourmaline. From Afghanistan. Bi-color Tourmaline - YouTube. GEM TYPE: Paraiba Tourmaline. Natural earth mined gemstone. Blue Green. SIZE: 9.15x6.55x3.38mm. SHAPE: Pear Shape. GEM TYPE: Paraiba Tourmaline. Natural earth mined gemstone. SHAPE: Oval. HARDNESS: 7-7.5. Natural earthmined Tourmaline facet grade rough. From Tanzania. Shape is oval cabochon cut. Product Specifics: on sale is NATURAL tourmaline. Natural Cut Gems. total Weight of this stone is 3.13 carat. Hardness on Mohs Scale is 7.0. This Will Help To Avoid Any After Sales Confusions. GEM TYPE: Paraiba Tourmaline. Natural earth mined gemstone. SHAPE: Oval. Peachy Brown. GEM TYPE: Tourmaline. Faceted here in the UK using precision cutting tools and correct refractive index diagrams to enhance the beauty of the gemstone. SHAPE: Round. Natural earth mined gemstone. We believe in solving the issues. These loose, Pink Tourmaline 100% Natural 3.00mm Round Faceted Bead 16" Strands, are sold by strand. PRODUCT ID: Y37-024 COLOR: MULTICOLOR. WEIGHT: 3.00 CTS. SHAPE / CUT: OVAL CUT LOT. Total Weight & Size may vary Slightly. Colors may seem different due to computer Display variation. SIZE APPROX: 6 X 4 X 2.2 MM ORIGIN: AFRICA. 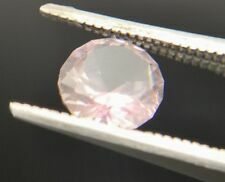 WEIGHT: 1.30 CTS. SHAPE / CUT: OVAL CUT. Total Weight & Size may vary Slightly. Colors may seem different due to computer Display variation. SIZE APPROX: 8 X 6 X 4.2 MM ORIGIN: AFRICA. PRODUCT ID: Y37-014 COLOR: PINK. Will make a stunning ring, is large enough for a pendant or add to your collection of this now rare gem cut from Nigerian rough. Gem: Rubellite Tourmaline. Scale in mm. All our Gemstones have been cut from natural, untreated, earth-mined rough. The photo does not show the actual size they are enlarged for better view, actual goods are small. This is one Blue Indicolite (Blue Tourmaline). It is much more beautiful than seen in the picture. Size : 9x7mm or 7x9mm. Blue Indicolite Tourmaline Pear 1.66ct. Origin : Afghanistan. Cut : Pear. This is a natural gemstone and is not treated. Pink Tourmaline. Loose Stone. Make your own Jewellery. For sale is a pink tourmaline gemstone. The stone weighs 2 carats. There are slight inclusions visible under the loupe. PINK TOURMALINE LOOSE GEM STONE, SQUARE CUT, AFGHANISTAN, 2 CARATS, NATURAL AND UNTREATED. Indicolite Tourmaline Oval 2.03ct SI. This is one Indicolite (Blue Green Tourmaline). It is much more beautiful than seen in the picture. Origin : Afghanistan. This is a natural gemstone and is not treated.